The Kemp family came to Spitskop in 1973. None of the 4 children where born on the farm but grew up here. The two brothers Koos and Hendrik bought the farm from their father Julius in 2002. Koos and Hendrik each registered their piece of land on their names. Hendrik and Estelle did not move to the farm until December 2005. They renovated and repaired the old farm house into a family house. The lodge that was previously owned by Hendrik’s father Julius burned down in 2003. Hendrik and Estelle started on renovation in February 2006 and the lodge was completed in April 2007. They did most of the building and renovation themselves. Today they are very proud of their handwork. Estelle loves entertaining and will love to host your next function or wedding. Estelle is a wedding and function co-ordinater since 2007 and will help any bride turn her dream day into a fairy tale. Estelle does everything from the invitations to the wedding suite for the couple. Estelle does decor for inside and outside functions. Estelle’s catering is of the highest quality, and only the best and freshest products is used.. When you book a function or wedding at Nyala Lodge, Estelle will arrange and do everything for you. So, you the client can sit back and be part of the planning but not of the hustle. 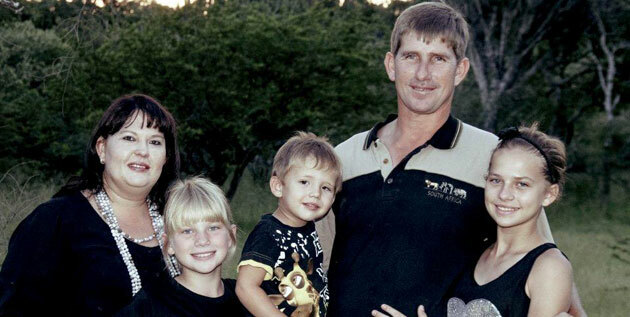 Hendrik is a born and bred farmer, and he farms with game. The farm Spitskop is situated in the Mara district. The farm lies on a area called Banyan. The name Banyan comes from the Banyan Fig tree, that is believed to bring good luck. There are a few of these trees on the farm. The name of the farm Spitskop originates from the two conical hills. The farms first belonged to the Roos family that registered the farm on their names . Some of the Roos family members where buried in the cemetery. The farm Spitskop was split up in a lot of smaller farms later years. There was a school on the farm many years ago and children from the surrounding farms would walk for miles to get to the school. The Roos family is not the only family buried in the cemetery. A well known General Nickolaas Serfontein is also buried in one of the two cemeteries. A resident of the Mara region Nancy Matheus, that now lives in the UK wrote a book on Mara called “Dancing on Mara dust” of Mara This book has a rich telling of the history of Mara and surrounding area. The name Nyala Lodge came from the Nyala’s that roam in a camp that the lodge is build on. It is beautiful to see them roam on the lawn at night.